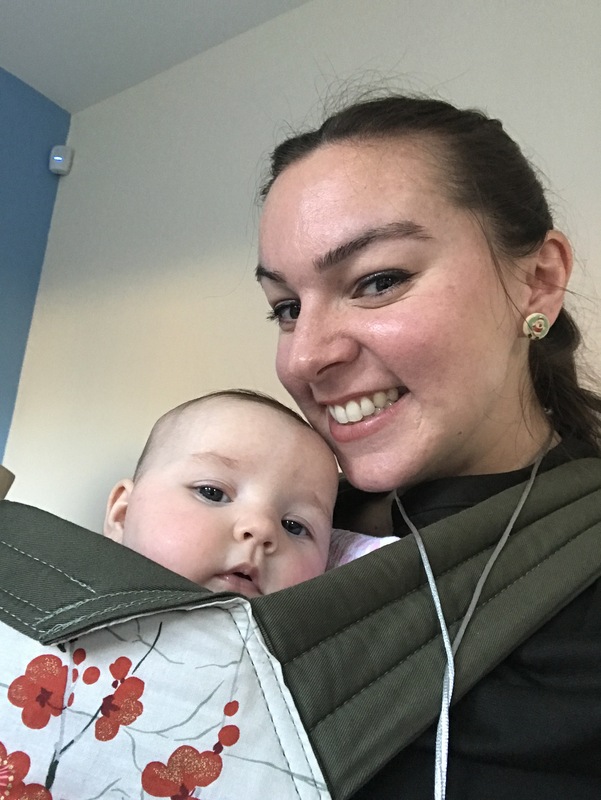 Back in December I wrote about my month using a Connecta baby carrier (you can read about it here) and the next baby carrier I loaned from the North East Sling Library was a Babyhawk Mei Tai in the Olive Garden design. It’s very pretty, dark green waist and shoulder ties with a cream, green and gold tree design to the front, and when I’ve looked online at them there are so many patterns, from plain to zig zags and everything in between. Rachel at the sling library recommended the Babyhawk after I couldn’t pull Grace in tight enough in the Connecta, and it wasn’t comfy over my shoulders. She said the design of the Connecta carriers is based on the concept of the Mei Tai, but the Mei Tai uses knots instead of buckles. I thought this was good, at least I was familiar with how the straps should go! Basically, you put the carrier on like an apron, secure with a double knot at your back, hold baby in place and pull up the material over them. You then take the straps over your shoulders, crossing over on your back and pull them round the front to tie under baby’s bum. I’m sure there are variations on this, but this was the way we were shown 🙂 I was worried that my knots wouldn’t be secure enough though and it would get loose then a bit unsafe but Rachel wasn’t so I decided to give it a go. So many carriers are just secured with knots, but being new to it all it was pretty scary. I had given the Babyhawk a quick try at the sling library session, but gave it the first proper go the next day when I went to a few shops and the supermarket (for a “big shop”) as I didn’t want the hassle of taking Grace backwards and forwards between car seat and pram. Overall I was really impressed. I managed to get the carrier on okay on my first go with the only criticism being that the tails of the shoulder straps dragged on the floor after I had tied it round my waist and was picking Grace out of the car. She was at first a little unsettled being bundled in it, but when I set off walking she soon calmed down and went to sleep… supermarket shop done in peace (well as much peace as you can get in Lidl on a Saturday morning!!) Win! So after a month of using the Babyhawk and even using it on Christmas Day, I was a lot happier but I wasn’t 100% it was for me, I couldn’t get back to the sling library to return it in January though so extended the loan for another month. I kept on using it in the next few weeks and as time was running out I started thinking about what kind of thing I wanted to try next. A friend of mine had bought a second hand Connecta from a selling page on Facebook so I had a trawl through one of the groups on there and saw a beautiful Tula carrier which I loved… and also a chevron pattern Babyhawk. I hadn’t tried a Tula so even though I really wanted to buy it I didn’t want to be wasting my money, and I kept checking every day to see if the Babyhawk had been sold! I think that was the point I realised how much I loved the Babyhawk! When I took my loan carrier back I did try a Tula but Grace was still too little for it (but too big for the newborn insert 🙄) so my mind was made up. I came home and bought the Babyhawk.